Jordan Spieth matched Tiger Woods’ Masters record, but he’s not the next Tiger. Sorry, Jordan Spieth. There will never be another Tiger Woods. 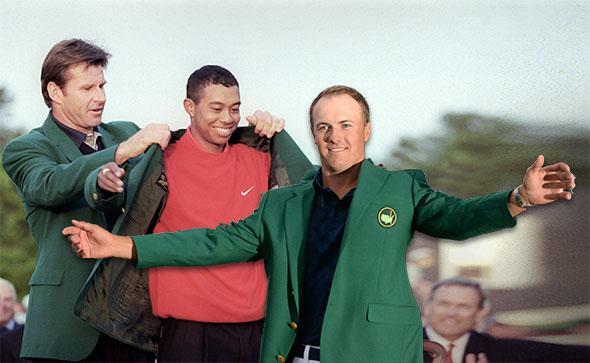 Tiger Woods, center, receives the Masters green jacket from Nick Faldo, left, in April 1997. Jordan Spieth, right, wears the green jacket after winning the Masters on April 12, 2015, in Augusta, Georgia. Photo illustration by Slate. Photos by Timothy A. Clary/AFP/Getty Images and Jim Watson/AFP/Getty Images. “The next generation is officially here,” Jim Nantz announced on CBS on Sunday evening, as Jordan Spieth returned to the clubhouse at the Augusta National Golf Club after capping off a wire-to-wire, four-shot win in the 2015 Masters. And although the 21-year-old Texan missed the short putt that would have secured his place, alone, in the record books, settling for an 18-under-par total of 270 to tie the tournament record established by Tiger Woods, it does indeed appear that the changing of the guard is upon us. Despite his brilliant performance, however, Spieth is not “the next Tiger Woods,” as some have already sought to dub him. Even if Spieth or another of the twentysomething prodigies often referred to as golf’s “young guns” could replicate Woods’ early talent, success, charisma, marketability, and association with social change, there is no way for another golfer to reproduce the conditions of Woods’ meteoric rise. Today’s fractured media landscape makes it impossible. There will never be another cultural phenomenon quite like Tiger Woods. After Spieth posted a record-breaking 14-under-par 130 in the first two rounds of the tournament, the press, always attuned to dramatic tales of late-career comebacks, growing rivalries, dominant figures, and emerging stars, swiftly drew comparisons to Woods’ 12-stroke victory at the 1997 Masters. Agence France-Presse called Spieth’s performance “Tiger-esque.” Golf magazine labeled him “U.S. Golf’s Heir Apparent.” CBS Sports’ Saturday telecast flashed a graphic noting both golfers’ initial success at Augusta. Almost overnight, Spieth assumed the mantle that has belonged to both future hall-of-famers, like Northern Ireland’s Rory McIlroy, and major disappointments, including Spain’s Sergio Garcia, all of them faced with the unenviable task of replacing one of the greatest golfers of all time. But for all the similarities between Spieth and Woods—both child prodigies, they are the only multiple winners in the 67-year history of the U.S. Junior Amateur Championship and both won their first PGA Tour events before reaching the legal drinking age—their respective star turns at the Masters are not analogous. It’s no knock on Spieth’s superlative play and preternatural poise to suggest that “Jordanmania” is unlikely to overcome the sporting world as “Tigermania” did nearly two decades ago, or that Augusta National is unlikely to be “Jordan-proofed” as it was “Tiger-proofed” in the wake of the 1997 Masters. This week in Georgia may well constitute a passing of the torch, but if the triumphs and tribulations of the Woods era have taught us anything, it’s that the golfing gods are fickle creatures indeed. One big reason to avoid any easy analogies between Spieth and Woods is the difference in their amateur and early professional careers. Though Spieth possessed an impressive résumé coming into this week—he played on the University of Texas team that won the NCAA men’s golf championships in 2012, and had two PGA Tour victories in 59 starts since turning professional—his results pale in comparison to Woods’ entering the 1997 Masters. In addition to his peerless junior record, Woods had, by that point, won an unprecedented three consecutive U.S. Amateur Championships, the 1996 NCAA individual title, and three PGA Tour events, his first two in just seven professional starts. Spieth’s steadiness has won him well-deserved praise from writers and tour veterans alike, but Woods was an immediate sensation. The sophisticated marketing campaign with which Nike launched Woods’ career thus combined an emphasis on his extraordinary skill with the not-so-subtle suggestion that Woods would change the face of the sport. The television spots “Hello World” and “I Am Tiger Woods” marshaled multiculturalism to sell Nike; its star endorser; and golf itself as newly diverse, democratic, even cool. As I reported for Deadspin last summer, Woods’ modest influence on amateur participation, particularly among people of color, has scarcely lived up to predictions of his “transformative” impact, but his unique background helped cultivate the sense of an epochal shift in golf that accompanied his Masters victory in 1997. A multiethnic young man had lapped the field in one of the sport’s most prestigious events, held at a club that had admitted its first black member only seven years prior. By contrast, Spieth, who counts former major champions Tom Kite and Ben Crenshaw among his mentors and hides a receding hairline under his cap, resembles any number of the tour’s young phenoms, with a slim build, tall frame, unruffled manner—and white skin. There’s no denying Spieth’s talents, nor those of McIlroy, who at 25 is the world’s top-ranked golfer and has already notched four major championships, including eight-stroke victories at the 2011 U.S. Open Championship and the 2012 PGA Championship. Yet the most important reason neither will be “the next Tiger Woods” has little to do with their on-course prowess or their personal histories. The fracturing of the media landscape, from the decline of print newspapers and the proliferation of cable programming to the advent of Twitter, means that no golfer, however dominant, is likely to match the mainstream appeal Woods enjoyed in the late 1990s and early 2000s. Tigermania emerged from a singular confluence of factors—Woods’ unparalleled success as an amateur, his rapid rise to the top of the professional game, his self-described “Cablinasian” heritage, his tightly controlled corporate image, his flair for the dramatic—but in retrospect none seems as essential as the broadcast networks’ ability, long since challenged by the innumerable distractions of the digital age, to turn sporting events into cultural touchstones. From this perspective, it seems unfair to expect Spieth, McIlroy, or any of the tour’s fresh faces to fill Woods’ shoes. Had his first Masters win occurred today, it’s not clear Tiger could, either. Spieth’s convincing victory, along with McIlroy’s final-round 66—seven shots better than playing partner Woods—may well signal, as Nantz proclaimed, the arrival of golf’s next generation. Even so, nothing is inevitable, least of all the combination of technique and toughness required to fulfill the high expectations that come with being the next big thing. When another 21-year-old tapped in for a 72-hole total of 270 at Augusta National 18 years ago this month, the fall of Jack Nicklaus’ mark of 18 major championships—the sport’s ultimate record—suddenly felt like it became a matter of when, not if. Not unlike the comparisons between Spieth and Woods, forecasting the whole of Tiger’s career at that early date now seems shortsighted. Jordan Spieth is no more “the next Tiger Woods” than Tiger Woods has turned out to be “the next Jack Nicklaus,” but that need not stop us from relishing either’s stroll into Masters history. With every changing of the guard comes the changing of the times, and there’s nothing wrong with acknowledging that there’s no going back.